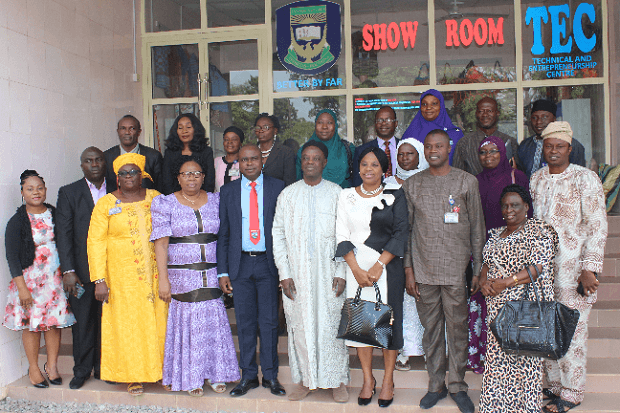 Prof. Chinedum Babalola, vice chancellor, Chrisland University, Abeokuta, Ogun State, has called on pharmacy school administrators as well as pharmacists in practice to embrace the wind of disruptive technology blowing across the profession. 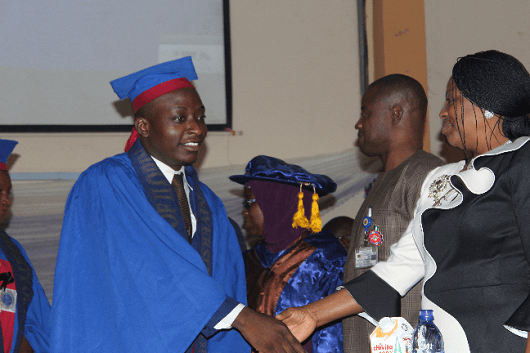 Delivering the keynote address at the induction and oath-taking ceremony of 18 pharmacy graduates of the University of Ilorin (UNILORIN) recently, Babalola stated that the old ways of impacting knowledge were gradually giving way due to technological advancement. L-R: Quadri Ajibola Omotesho, overall best graduating student, in a warm handshake with Prof. Chinedum Babalola, vice chancellor, Chrisland University while Dr. Rasheedat Ayanniyi, acting dean, Faculty of Pharmaceutical Sciences and Dr Olayinka Buhari, deputy vice chancellor, UNILORIN look on. “I am happy that UNILORIN has also taken the bull by the horn by commencing its PharmD programme. This is exactly how the success story of Amazon started when Jeff Bezos (owner) evolved from selling books to becoming one of the biggest online retail giant. “Unlike in the past, today’s students are now allowed to own and use phones for research and academic study. Schools no longer see them as objects of distraction but objects of disruptive innovation,” she emphasised. While describing Pharmacy as the first daughter of medicine (or the healing arts, as it was called), the keynote speaker reminisced that people like her were fortunate to find themselves in the profession even though she originally wanted to study Mathematics or Agriculture. A cross section of UNILORIN management staff, PCN team, guest speakers and academic staff of the Faculty of Pharmaceutical Sciences at the induction ceremony. “Nevertheless, I settled for it and resolved to give it all it took. And, of course, this was what has brought me this far. Let me also state that of all the challenges plaguing the profession, lack of enabling environment remains one of the biggest. “Other obstacles include poverty, low knowledge of the profession, low morale, lack of political will, poor access to medicine, among others,” she said. “As a parting gift, I want to encourage you to think outside the box, own the drugs, own the profession and rule your world,” she charged them. In his opening remarks, Pharm. 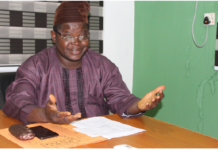 N. A. E. Mohammed, registrar, Pharmacists Council of Nigeria (PCN), represented by Pharm. Anthony Idoko, congratulated the graduands, parents, UNILORIN vice chancellor, academic and non-academic staff of the institution, noting that the faculty was living up to standard. “These promising young men and ladies here today have completed the first phase of their training as professionals and are now fit to compete favourably with their colleagues in all areas of practice for services to humanity and also to God. “The second phase of your Pharmacy training starts with the one-year statutory internship programme, which is compulsory for all pharmacists in Nigeria, including those who trained abroad without evidence of licensure in countries of practice,” he said. Mohammed who expressed disapproval of professional misconduct in its entirety, revealed that any report of misconduct by a pharmacist is usually investigated by the PCN investigating panel which refers erring pharmacists to the disciplinary tribunal (having the same status as a Federal High Court) when found guilty. “Note that sentences such as removal of a pharmacist’s name from the pharmaceutical register for a given period of time could be passed. “This is why I enjoin you to keep off the Register-And-Go syndrome that has tarnished the image of pharmacists and brought the profession to ridicule. Learn to always uphold the ethics of the profession at all times,” he charged. The PCN also counselled the university management to always retain its best students for internship and official engagement. “I also want to sound the note of advice to the new graduands. Do not fill your career with abandoned projects; make purposeful changes in life to complement your experience; be focused and wait patiently for your time,” Mohammed charged. In a related development, Prof. Sulyman Abdulkareem, vice chancellor, UNILORIN, has made a passionate appeal to the leadership of the PCN to review its admission quota. “I sincerely want to push for an adjustment in your admission quota. Please find a way of increasing it because we need to further encourage people to consider Pharmacy in our admission process. “I once spoke with Late Prof. Abdulkarim Agunu and others to see how they can encourage graduands to opt for teaching and academics because it is the only way to sustain quality education and continuity,” he appealed. Next articleHow Committed Are You?